BBC News - World News Today - Could Guatemala become a failed state? Could Guatemala become a failed state? 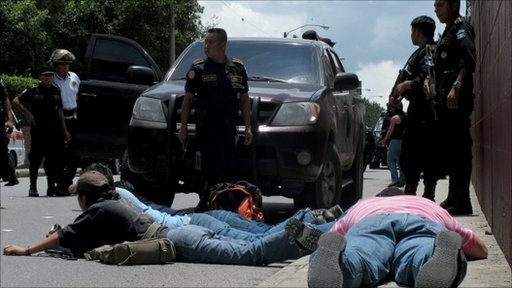 The Central American state of Guatemala is one of the most dangerous countries on earth. It is the major transit route for drugs from Colombia to Mexico and on, into the United States, a trade that involves vicious gangs from Guatemala itself and the region. There are fears inside and outside the country that Guatemala is in danger of becoming Latin America's first failed state, with organised crime corrupting many national institutions. Zeinab Badawi reports from the capital, Guatemala City. World News Today with Zeinab Badawi is broadcast weekdays at 1900, 1930 and 2000 GMT on the BBC World News channel. Find out more information about regional broadcast times here.